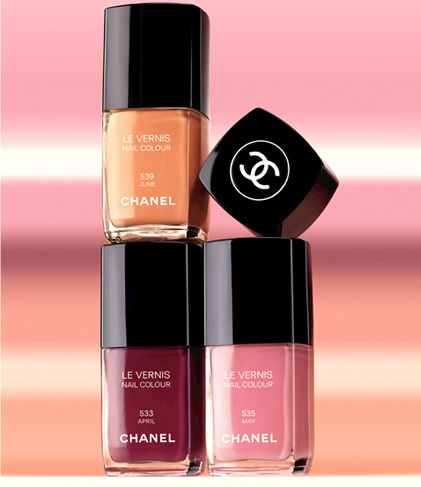 New Le Vernis shades from Chanel: is January too early to talk about April, May and June?!? These lovelies are the always-hotly-anticipated new season Le Vernis nail colours from Chanel. Part of the daybreak/twilight inspired Harmonie de Printemps collection that I talked about here, you’re looking at April (the garnet), May (the pink) and June, that very on-trend tangeriney/peachy colour (tangerine is the colour of the year, don’tcha know?). June is limited edition, so if you spot it, be a darling and snap me up a bottle would ya? The collection is available in Ireland from 27th January (when the polishes will be priced at €21.50 each) but you can be ahead of the game by shopping directly from Chanel.com, now. June will be mine... I'm tellin ya, as soon as Christmas is over, I'm all into Spring mode! I'll be fighting ya for it Karen! I can't wait to get these, June especially! They would make the best colour the limited edition one wouldn't they?! Oh my God, I need June! Love the colours, they are so pretty. I am always so let down by Chanel polishes, they really do chip so easily, and not by doing hard work, mine have often chipped while im washing my hair!! I love April it is so so fab! Love the garnet, I'm just obsessed with anything that kind of colour at the moment! Now if I hadn't read your blog...I would never know that Tangerine is the IT color. Thank goodness! I love May & June, but the more I look at April I like that too...damn it im just going to have to buy all three!